By definition cystitis means inflammation of the bladder, and the term is used as a general description for any disease that causes inflammation. A number of diseases and conditions can cause the inflammation that is called cystitis. The most common cause of cystitis in dogs is an infection caused by bacteria. Other common causes include bladder stones, tumors or polyps in the bladder, and abnormal anatomy (especially in female dogs). Some dogs will experience interstitial or “sterile cystitis”, a condition that causes inflammation and associated clinical signs without any infection. You may have heard of this type of inflammatory cystitis in people. What are the clinical signs of cystitis? The most common clinical sign is hematuria or blood in the urine. Cystitis causes discomfort and pain. Dogs with cystitis may spend several minutes squatting and straining (straining is called dysuria) to produce only a small amount of urine, and they may urinate more frequently than normal (called pollakiuria). Many pet owners report observing their pet squatting frequently and dribbling little spots of urine in multiple locations. Bacterial infections usually cause hematuria and dysuria. 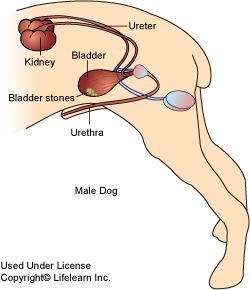 Bladder stones are caused by excessive amounts of crystalline minerals in the urine. The crystals have sharp edges while the stones can have rough surfaces; both can cause irritation as they rub against the bladder wall. In severe cases, the bladder stones may block the urethra and obstruct the flow of urine, which is a potentially life-threatening condition. 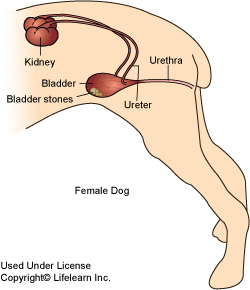 In dogs, bladder stones frequently form as a result of bladder infection. Tumors or polyps are usually not irritating to the bladder, but they can cause bleeding and straining to urinate. A urethral diverticulum is an abnormal anatomical defect consisting of a small pouch in the wall of the bladder or urethra. Bacteria can easily get into this protective pouch and set up an infection that is extremely difficult to treat without surgical removal of the pouch. A history of hematuria, dysuria, and pollakiuria is strong evidence of some form of cystitis. When any or all of these symptoms are seen, several tests are appropriate. The first group of tests includes urinalysis, urine culture, and bladder palpation (feeling with the fingers). A urinalysis consists of several tests to detect abnormalities in the urine and urine sediment. These are generally adequate to confirm cystitis, but they may not tell us the exact cause. A urine culture and sensitivity determines if bacteria are present and what antibiotics are likely to be effective in killing them. This is often indicated because bacteria cause most cases of cystitis in the dog and usually eliminated easily with the appropriate antibiotic. Bladder palpation is the first “test” for bladder stones, since stones may be large enough to be felt by the veterinarian. What is done if cystitis is present, but the culture is negative for bacteria and bladder stones cannot be felt? This scenario occurs about 20% of the time. When it happens, it is important that more tests be performed so that a diagnosis can be achieved. Bladder radiographs (x-rays) are taken to evaluate the bladder for common types of bladder stones. However, the mineral composition of some stones requires that special radiographs, using contrast materials, be used in certain cases. Plain radiographs rarely show bladder tumors, polyps, or diverticula. A plain radiograph can be made without sedation or anesthesia in most dogs. An ultrasound examination is extremely useful in evaluating the bladder. This technique uses sound waves to visualize stones as well as some tumors and polyps. It may also identify other abnormalities of the bladder wall, including wall thickening. It can often be performed without sedation or anesthesia. Contrast radiographs of the bladder are taken when plain radiographs and/or an ultrasound examination do not provide a diagnosis. In this three-step process, a urinary catheter is passed and the bladder is first filled with a negative contrast material (usually air), then a positive contrast material (a special radiographic dye), and finally a positive contrast material with a negative contrast material (double contrast study). A radiograph is taken after each step. These three procedures permit visualization of otherwise unseen bladder stones, tumors and polyps, diverticula, and wall thickening. Since it is necessary to pass a catheter into the bladder and to distend it with the contrast materials, sedation or general anesthesia is required. If a dog shows other signs of illness, such as increased production of urine, fever, poor appetite, or lethargy, cystitis may be a symptom of a more serious problem. These dogs should be evaluated for systemic diseases and bleeding disorders, using tests such as a biochemistry profile and complete blood count (CBC) should be performed to assess metabolic and organ function. If a clotting problem is suspected, a bleeding or clotting profile is appropriate. The most common diseases that can cause cystitis as a secondary problem are diabetes mellitus, Cushing’s disease, and kidney disease. Treatment is based on the cause. Bacterial infections are generally treated with antibiotics. Some bladder stones can be dissolved with special diets while others require surgical removal. Benign bladder polyps can usually be surgically removed, but malignant bladder tumors are difficult to treat successfully. A bladder diverticulum should be removed surgically. In the initial stages of treatment, many cases of cystitis require pain relief or anti-inflammatory medications to relieve discomfort and improve urine outflow. Once the discomfort is relieved, many patients with cystitis benefit from increased water consumption, either by drinking more water or eating a moist diet, which will dilute the urine and help flush out bacteria, inflammatory debris, and dissolved crystals. Your veterinarian will discuss the appropriate tests and treatments necessary to return your pet to normal health as soon as possible.